By nesting splitters inside the panes of other splitters and alternating the Orientation of the nested splitters, you can define complex structures that divide the page into vertically and horizontally resizable regions. You can nest splitters up to any depth. 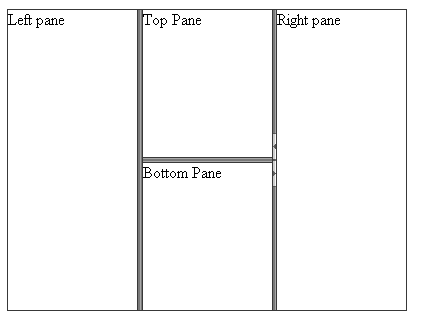 By default, the nested splitters are resized when the panes that contain them are resized. If you do not want the nested splitters to resize together with their parent panes, set the ResizeWithParentPane property to False. RadSplitter must have at least two child RadPanes. You can experience many unexpected issues when the control is used with a single RadPane, making it a highly not recommended scenario.